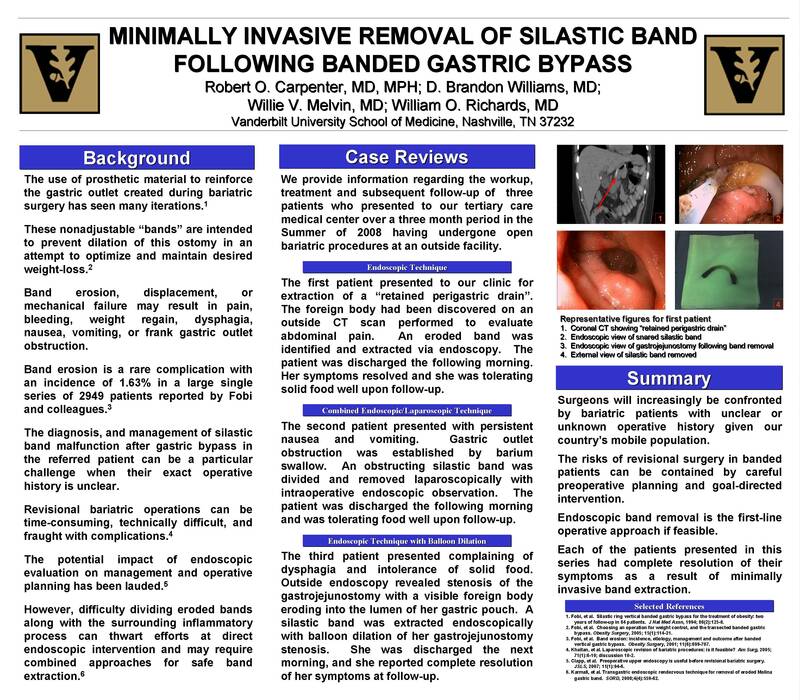 INTRODUCTION – Diagnosis and management of silastic band malfunction after gastric bypass in the referred patient is the focus of this paper. The use of prosthetic material to reinforce the gastric outlet created during open bariatric surgery has seen many iterations. These “bands” are intended to prevent dilation of this ostomy in an attempt to optimize and maintain desired weight-loss. Band erosion, displacement, or mechanical failure may result in pain, bleeding, weight regain, dysphagia, nausea, vomiting, or frank gastric outlet obstruction. Surgeons may be confronted by seemingly complex problems in bariatric patients with unclear or unknown operative history given our country’s mobile population. METHODS – We provide information regarding the workup, treatment and subsequent follow-up of three patients who presented to our tertiary care medical center over a three month period in the Summer of 2008. Each of these patients had undergone an open bariatric procedure at an outside facility. The first patient presented to our clinic for extraction of a “retained perigastric foreign body or drain” discovered on an outside CT scan performed to evaluate abdominal pain. An eroded band was extracted via endoscopy and the patient was discharged the following morning. Her symptoms resolved and she was tolerating solid food upon follow-up. The second patient presented with persistent nausea and vomiting. Gastric outlet obstruction was established by barium swallow. An obstructing silastic band was divided and removed laparoscopically with intraoperative endoscopic observation. The patient was discharged the following morning and was tolerating food well upon follow-up. The third patient presented complaining of dysphagia and intolerance of solid food. Outside endoscopy revealed stenosis of the gastrojejunostomy with a visible foreign body eroding into the lumen of her gastric pouch. A silastic band was extracted endoscopically with balloon dilation of her gastrojejunostomy stenosis. She was discharged the next morning, and her symptoms were resolved at follow-up. CONCLUSIONS – We present a series detailing a simple yet effective solution to a complication of banded gastric bypass. Each of the patients in this series had complete resolution of their symptoms as a result of minimally invasive band extraction. Representative imaging is provided and the pertinent literature is reviewed as an aid to surgeons confronted with this clinical problem.